Quality. An important factor when determined the value of a coin. There are many degrees of quality. And that quality is valued an opinion. In fact, it is important to understand that not only does supply and demand value coins, but also the willingness of what a buyer feels they will pay for a coin in relation to what a seller feels they are willing to price for that same coin. Take a look at the coins in the photograph. 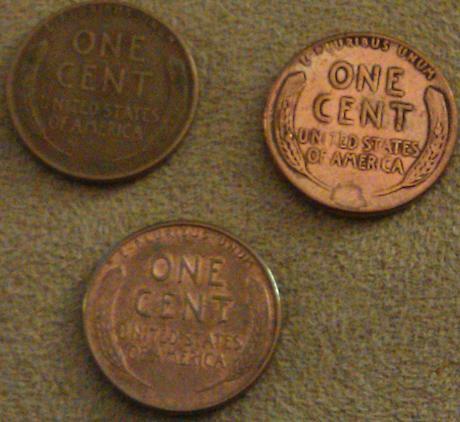 All three coins were pulled out of circulated coin. You can clearly see different degrees of “wear and tear” that has occurred on these circulated coins. The primarily factors causing devalue here are scuff marks, scratches, nicks, and the degree of the outer plating has worn off. Note that none of these coins were altered, polished, or improved in any manner prior to this photograph being taken as far as we are aware. They were randomly found and pulled out of circulated coin and photographed as an illustration in quality of coins to be found. There are plenty of other more “beat up” examples we could provide, but we wanted to show a comparison of higher quality circulated coins that can be found.